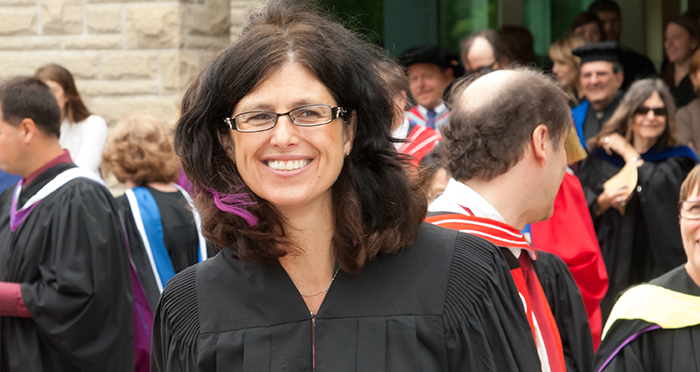 Dr. Cathy Chovaz, assistant professor in the Department of Psychology at King's, is the recipient of the 2013 Western University Autism Centre of Excellence Research Award. Dr. Chovaz is Canada’s first Deaf clinical psychologist and teaches courses in clinical psychology, focusing her area of expertise on mental health and deafness. King’s Associate Academic Dean, Dr. Renée Soulodre-La France, is pleased that Dr. Chovaz’s innovative approaches to research in Autism and the Deaf are being supported and encouraged through Western University. The grant monies will go towards the work directed by Dr. Chovaz and her colleague, Dr. Ken McIsaac, Western Engineering Department. The electronic device will measure stimuli such as temperature, noise, smells, humidity, and vision. It will allow Dr. Chovaz and Dr. McIsaac to analyze the data and determine patterns of triggers and behaviour responses. By merging clinical psychology and computer engineering, Dr. Chovaz and Dr. McIsaac will be able to study the causes of behavioural issues in ASD individuals with a device that has never been explored before. The Western University Autism Centre of Excellence invites applications for Research Awards to conduct research into causes, diagnosis, and treatment of autism and related pervasive developmental disorders.